Oracle Sales Cloud is a cloud-based, lead-to-contract sales solution that allows representatives to make connections, build relationships, and close deals. Oracle Sales Cloud key features include sales automation, unified sales and service, performance management, partner management, CRM integrations, CX platform, and more. 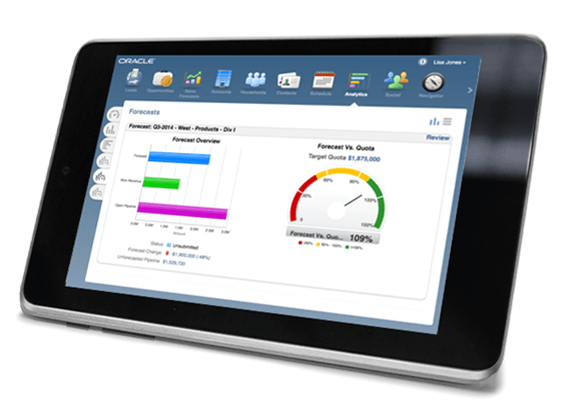 Oracle Sales Cloud offers interactive visualizations to give sales managers intelligence into company forecast, pipeline, team performance, and overall sale performance. Sales Cloud also provides more than 100 pre-built, custom reports for tablets and desktop and mobile devices. Users can maximize sales with a tightly integrated, complete set of lead-to-contract sales tools. Team members can access to mobile apps, a complete customer 360 view, and sales team collaboration tools. Not sure if Oracle Sales Cloud is right for you? Use our Product Selection Tool to compare other sales software solutions. Have questions? Call one of our unbiased Technology Advisors for a free consultation. Learn everything you need to know about Oracle Sales Cloud. Our experts will reach out to you shortly.